I was in Std VII, when Br. Submitted by Joseph Melville... on February 21, 2015 - 12:59pm. I was in Std VII, when Br. Rodgers came to coach us in hockey and football. I also recall Frs. Basil D'Penha and William Rebello from this pic. Tks for your tribute, my dear Godfrey. "We are all in the gutter. But some of us are looking up ... at the stars." - Oscar Wilde. Submitted by Godfrey DSouza on February 20, 2015 - 12:20am. Submitted by Arvind Rajashekar on December 6, 2009 - 12:58pm. Masters Govind, Eric Fernandes and Bernard Donald have all taught me and the others, for those of my batch they were there and very familiar figures in the school. Thanks Godfrey, this snapshot really brought back memories. Submitted by Godfrey DSouza on October 8, 2009 - 12:49am. 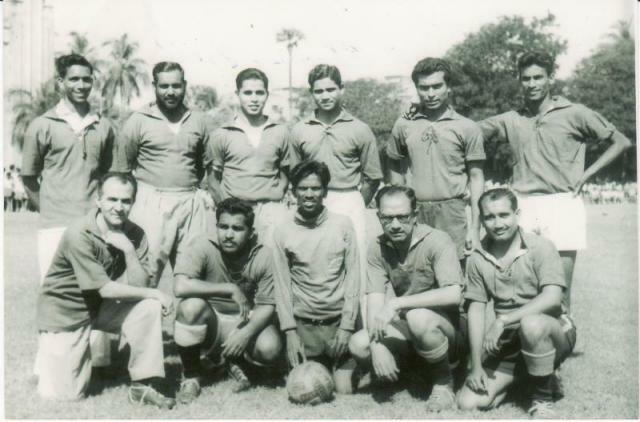 Freddie Pimenta sj,Basil D'penha sj,Richard Rogers sj,William sj,Govind Budhrani-Hindi, Eric Fernandes- Sports. James Fabregad sj,Oliver Andrade- Sports,Master Azad- Admin,Bernard Donald-Maths,James Kundarji-Science. Submitted by iborges on February 20, 2015 - 12:20pm.